John Oliver Takes Down Debt Buyers.Oliver bought for about $60,000. Earlier this month, “Last Week Tonight” host John Oliver made television history when he orchestrated the largest one-time giveaway in history on his HBO program. But he didn’t give away a car to everyone in his studio audience, a la Oprah Winfrey from back in 2004, a stunt which gave away an estimated $8 million in prizes. No, instead Oliver did something a bit more unique – he forgave about $15 million in total debt from about 9,000 consumers. It was debt that Oliver bought for about $60,000 – less than half a cent per dollar – after he started his own debt buying company. But as you might imagine, Oliver has no interest in becoming a debt buyer, the giveaway was really the culmination of a scathing takedown on debt buyers and how unregulated the practice is – especially when many debt buyers are attempting to recoup significant medical debt, debt that people need to either take on or risk death in some cases. What is Debt Buying (and Why is it Scary)? It’s estimated that Americans owe a total of about $12 trillion in debt, $435 million of which is considered to be “seriously delinquent,” or 90 days or more past its due date. Such debt can also take a toll on one’s credit score. When a lender has “given up” to a certain extent on collecting debt, it has become common for them to sell it off at an extremely reduced rate to a debt buying company. This debt buyer can then go after the consumer in an effort to recoup the total amount owed, as they now have access to consumer names, social security numbers, phone numbers and other personal information. Debt buyers are unlike a collection agency because they’re not working for a lender – they own the debt outright, and sometimes the lengths at which they’ll go to collect are extreme and possibly illegal. For instance, they’ll often harass people at home or at work, threaten violence or even contact their bosses at their places of employment. And if they can’t get the debt through intimidation, they’ll file a lawsuit. In fact, in some American cities, debt buyers file more lawsuits than any other type of plaintiff. 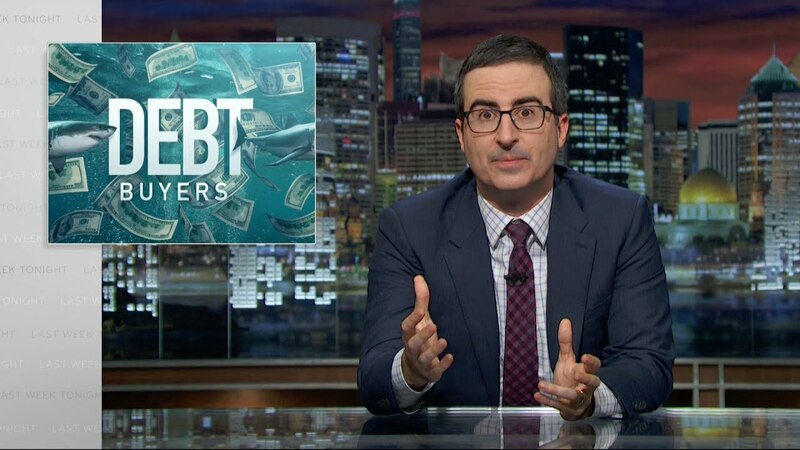 As Oliver highlighted in “Last Week Tonight,” debt buying is a sleazy business. But what really makes it scary is how unregulated it is. In many U.S. states, for example, anyone can become a debt buyer. Oliver himself knows this because he spent $50 to create CARP, a debt buying company based in Mississippi, in order to buy the $15 million in medical debt that he forgave on his show. Oliver forgave the debt that he acquired through CARP, but he’s probably the only debt buyer that has done so. But here’s to hoping his stunt on “Last Week Tonight” opened the eyes of policymakers that debt buying needs some significant reform.